There’s nothing better than creating and delivering a comprehensive, end-to-end strategy for an enthusiastic client. That’s because, when a business entrusts you with their whole online presence, there’s unlimited opportunity to help them improve and evolve. There’s an excitement that comes with the scale of the project. GALE Pacific Limited offered that kind of project. They’re one single business with a detailed history, a range of retail and commercial divisions, a wide variety of strategic goals and a pretty keen desire to achieve them all. Our challenge: develop a digital strategy to revitalise each of the core brands, boost their progress, and improve their digital presence. All while keeping things consistent across the whole family. Of five individual websites. We set out to do exactly that, by partnering with GALE Pacific Limited to create a whole new world of digital. 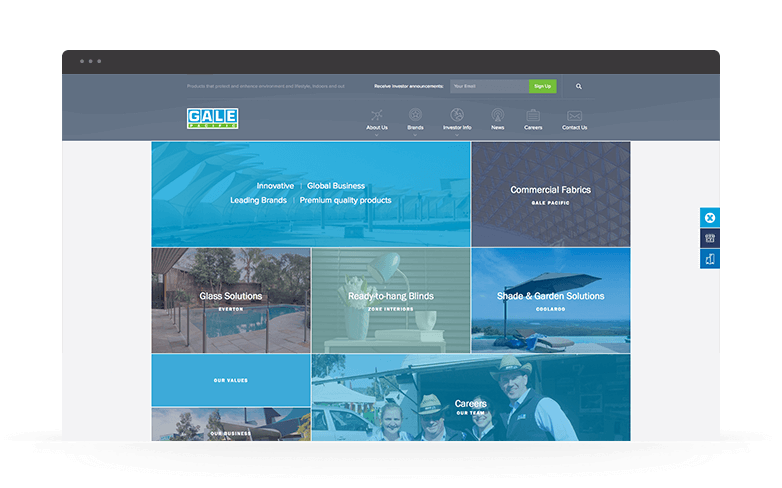 GALE and its related core brands now have four websites, plus a gateway corporate site. Each brand’s site has a look and feel that is both versatile and unique, featuring bold, distinctive colour palettes that reflect each business. Large, striking photography gives life to each brand and inspires the audience. It’s about providing a detailed visual showcase to highlight how GALE products offer aesthetic harmony and great functionality around the home. There are a couple of innovative tools for potential DIY-ers too. 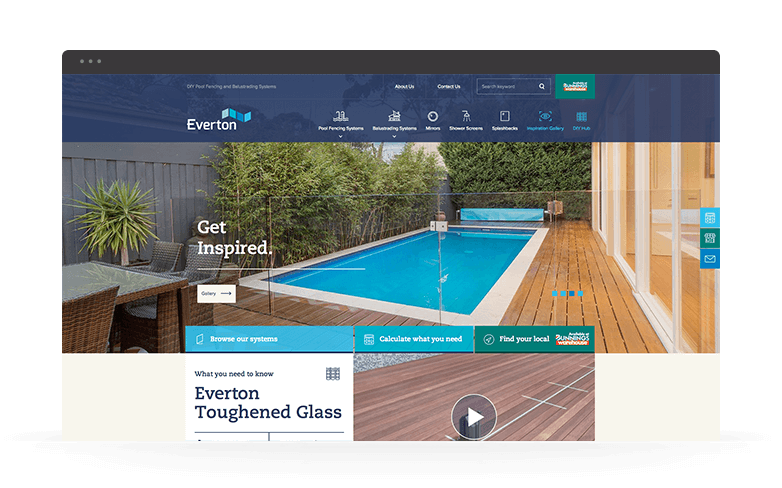 The Everton site features an awesome custom calculator – it helps make planning your glass pool fence or balustrade project as easy as possible by providing tailored project estimates and material lists. There’s also essential information for before and after you’ve completed your project, plus videos to guide you through the installation process. You can have a glass pool fence or balustrade up in a weekend! 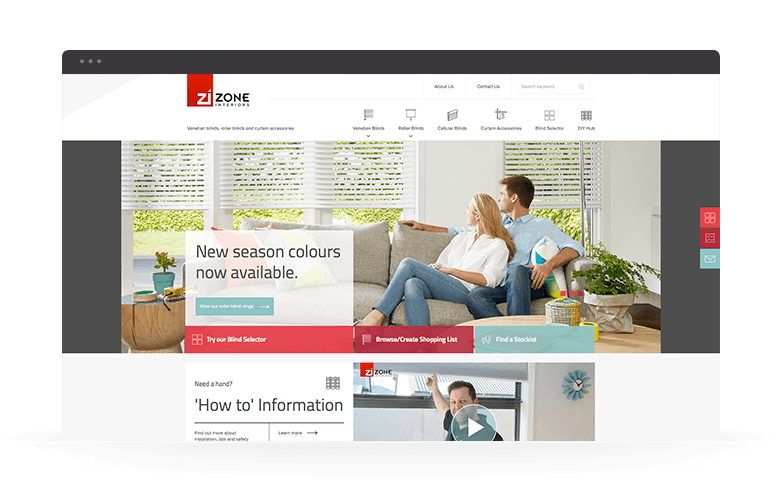 Zone Interiors’ site provides a speedy online research and selection experience, thanks to the blind selector tool. The tool enables users to apply a range of filters to a product search, narrowing down potential search options to help users find the right blinds, faster. The idea is to spend less time hanging around on the site, so you can head straight into your local retailer to pick up the product you’re after and start hanging your brand new blinds at home. Coolaroo’s website features a comprehensive DIY content library. 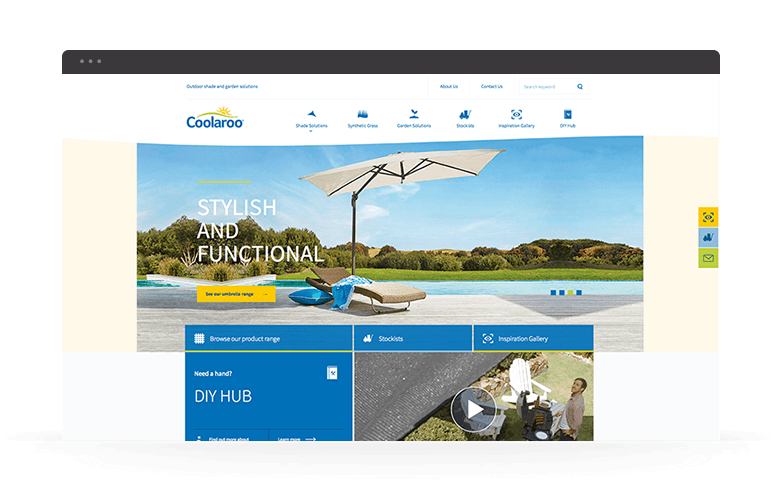 It’s full of useful information, supportive walk-through videos, and some motivational tips and tricks to help users with inspiration and installation. If you’re looking for a forward-thinking approach for your next backyard project, just take a look at the DIY Hub – you’re sure to be inspired. GALE Commercial has a primary focus on business-to-business activities. With that in mind, we created a comprehensive resource Downloads Hub. The Hub provides access to a range of industry reports and reviews, product warranties, brochures and field test results. That way, potential buyers can get the full picture of every product before they engage to purchase a commercial amount. Finally, the GALE Pacific corporate site. The gateway to Gale “world”, it offers a birds-eye view of the entire GALE landscape – from DIY glass to synthetic grass, from investor information to interior design pointers, and everything in between. The site provides information about all of the individual retail and commercial businesses, alongside simple gateway links to each of their respective websites. There is extensive information for investors, reports detailing research operations and annual performance, a news centre, and even a recruitment section. That’s GALE world: a comprehensive snapshot into a proud global retailer, and the perfect destination for your next DIY project. Take a look through each of the sites today. Whether you’re looking for some insight into the company or inspiration for the home and garden, you’re sure to find something! GALE Pacific Limited (GALE) is a trusted leading global marketer and manufacturer of branded screening and shading products for domestic, commercial and industrial applications. 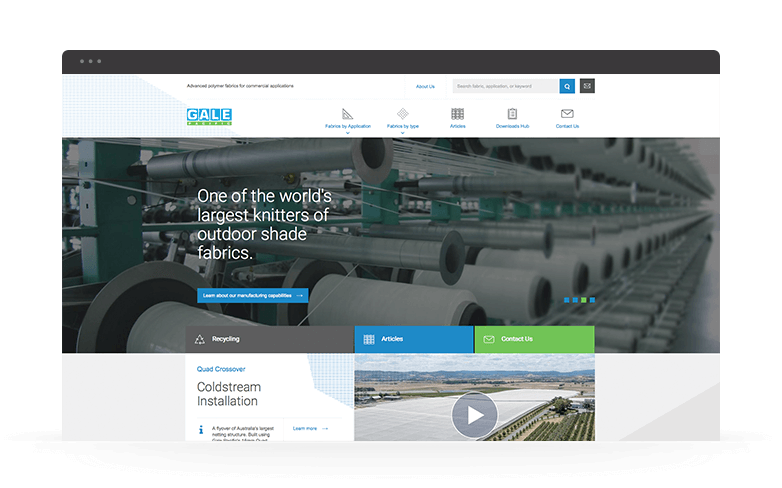 GALE Pacific invented high density polyethylene (HDPE) shade fabrics in the 1970’s and is today a leading global manufacturer of advanced polymer fabrics including knitted HDPE outdoor fabrics, coated HDPE and PP waterproof fabrics and PP coated mesh fabrics. August is now a certified B Corporation!